‘The Insiders’ is the newest show on the web horizon. Backed by two giants like TVF and MX Player, the show started streaming on 12th April and has got a good response from the audience. 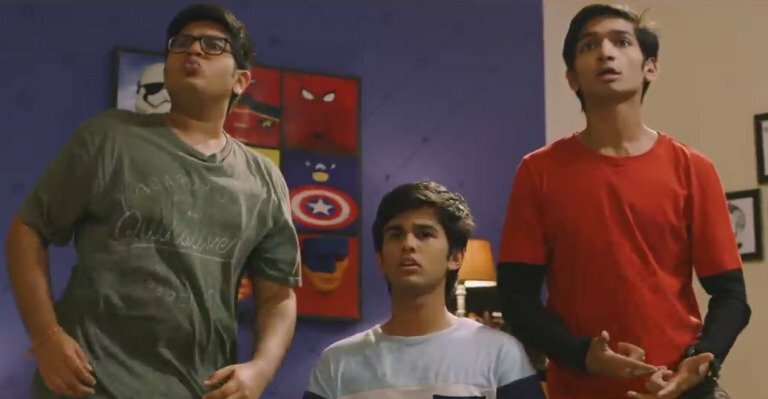 Here is an exclusive chat with Omkar Kulkarni, Ritviq Joshi, Arnav Bhasin and Himika Bose, the lead actors of this teenage drama. One sees so many youth-centric web shows these days. What makes ‘The Insiders’ different from them? Omkar: I think the USP of this show lies in the fact that everybody will see the show in a different way or perspective. There is a lot of scope for fan theories in the show. If somebody watches the show again after having finished watching all the episodes, he will have a different perspective of certain things that he saw in the show. There are a lot of pop culture references in the show as well. Ritviq: Yes, there are a lot of them. It is about the things which we grew up on like the K-Serials, Kaun Banega Crorepati, Interstellar. Many of those references are put across in an indirect manner but since most of us have grown up surrounded by these things, the audience will be able to relate to them. The web space has exploded in a way. There is so much content to choose from. In such a scenario, how does one make sure that the content you create stands out? Himika: I think we should appreciate the fact that there is so much content and we have an option to watch different things. Because of web, so many people are getting opportunities to showcase their talent. There is a lot of content but I think if you have made something good, it will definitely stand out and reach out to the audience. Ritviq: If you talk about the boom, the solution is not to stop making content. The audience needs to be ready and they should be open to accepting different kind of content. Omkar: Marketing is extremely important in today’s times. I guess this is where MX Player or a TVF comes into the picture. They already have a huge audience base. TVF has been the pioneers of the web space in India. Having a good production house or a big platform behind us is a big thing. If the show is not good, the audience will anyways reject it but if you make a good show and do not promote it, it might take a while to reach out to the audience. A successful show is a mixture of good content and aggressive marketing. Can we expect to see multiple seasons of the show? Himika: It depends on the audience’s response. If the show is a hit, the makers will be encouraged to develop another season. Ritviq: There is a lot of scope for the show to grow. It is a cinematic universe in itself. As actors, what is the most exciting part of being a part of this web space? Arnav: You get so much time to explore a character. You can work on the nuances of the character. That is the most exciting thing for me as an actor. Himika: it is a great space for an actor to work in. Also, as a viewer I am excited to see so much experimental content being made on the web. I feel the internet plays an important role in bringing a change in the society. Something like homosexuality has been normalised in our society because of the awareness the internet created about it. Girl, you were a part of ‘Padman’. Are you open to working in films and other mediums as well? Omkar: I come from a theatre background and I love being in front of a live audience. As long as you are telling an honest story, the medium does not matter. I want to keep telling new stories. The medium does not matter that much. Ritviq: I agree with him. The medium does not matter. The need of the audience is evolving. I am also a writer and a director, so I understand that need well. I feel there is there is a continuous pressure to do something that has not been done before. The audience is constantly looking for fresh and novel content. All of you are quite young. What would be your advice to all the aspiring actors who come to Mumbai with dreams in their eyes? Himika: I would just say that believe in your dreams and go by your instinct. Ritviq: A lot of people are attracted by the glamour in this profession and not the craft they seek to pursue. Himika: You have to be passionate about your craft. I was lucky enough to be spotted by Abhishek and Anmol Ahuja from Casting Bay. I know there is a lot of struggle involved in being an actor. The only way to succeed is to work hard and be patient. The show is about teenagers. What are your fondest memories of being a teenager? Omkar: The best thing is that nothing is really at stake. Maybe, things are at stake but we do not realise that. You do things without thinking about the consequences. As you grow older, you get more serious about things. Arnav: I am still a teenager. I am 19. Every time I go for an audition, I see much older people auditioning for the same role that I have come to audition for. I feel good about the fact that I am young and have a lot of time in my hands. Riviq: I tend to interact with older people. During my teenage years too, I mostly bonded with people much older to me. Himika: I started working when I was 16. I missed out on doing a few things you do as a teenager but I have no regrets.